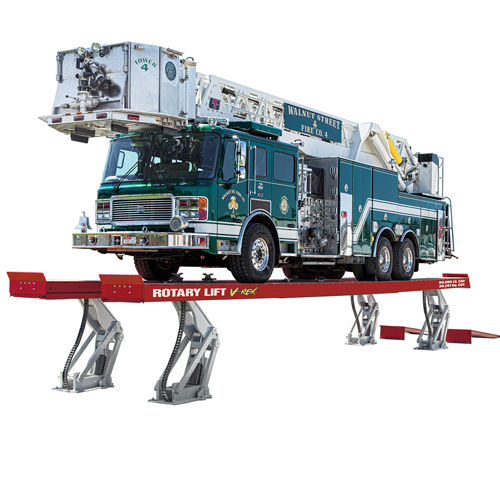 Red Fire gives you the ultimate in lifting versatility, mobility and flexibility! Exclusive software means no more cords, keys, or chips. 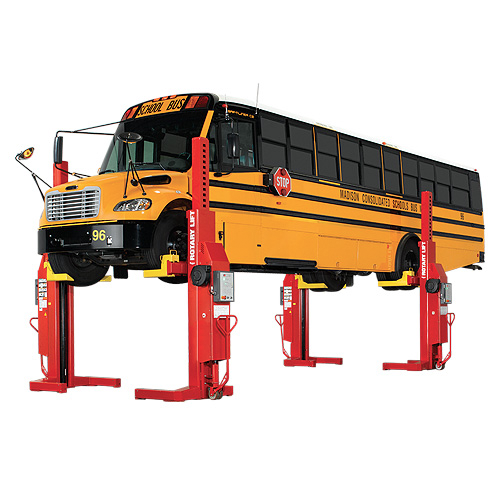 Two, four, six or eight column configurations can accommodate heavy duty vehicles up to 150, 400 pounds! 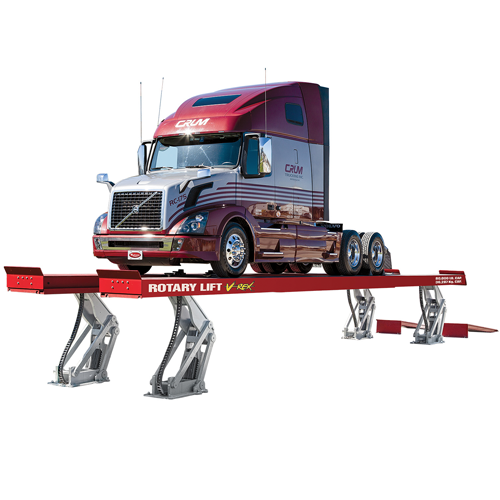 Rotary's versatile, remote-controlled, mobile lifting system gives you the power and mobility to make service repairs anywhere in your shop. 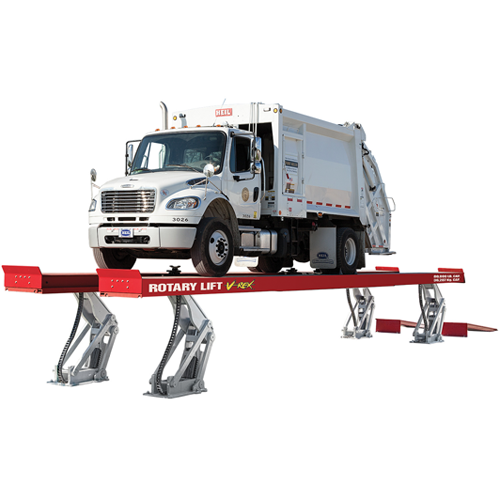 Rotary's MACH FLEX 14 mobile column lift give you the option of not being tied to a bay. Get the job done where ever you have the space. Our easy to use design give your technician the control from any column. Our forklift pockets provide a convenient way to relocate columns within your shop. Included with every lift, they are clearly labeled for easy handling. Easy to move adjustable forks improve set up time without the need for reducer sleeves. Adjustment range is 6.3" to 23.6" to accommodate approximate tire sizes 9" to 24". 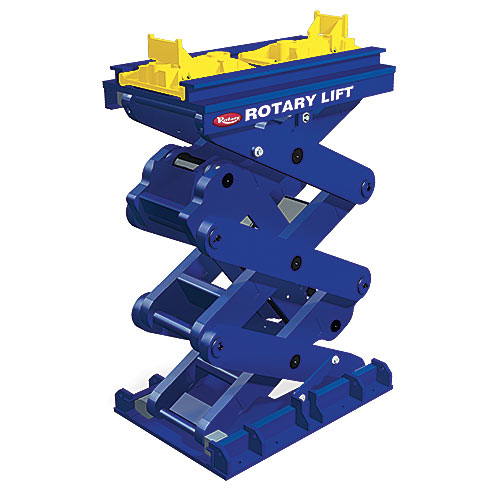 Rotary invented the inground lift nearly 90 years ago and we’ve been reinventing our lifts ever since. 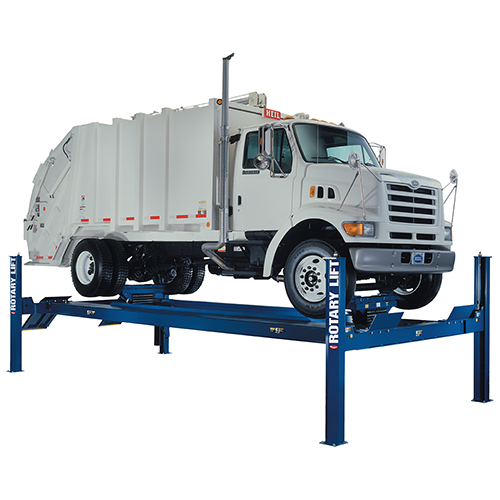 The MOD30 inground lift is totally contained in a 6' enclosure protected with Rotary's exclusive Enviroguard™ coating. 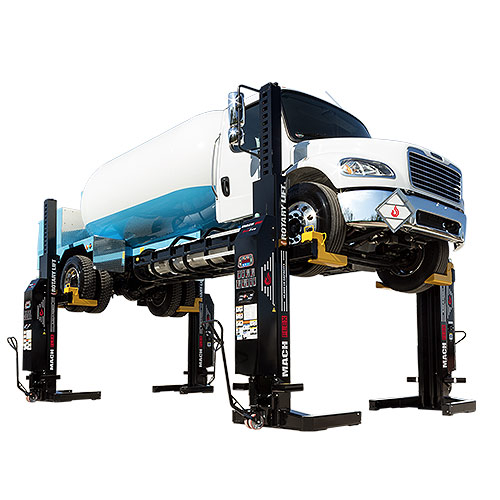 This environmentally friendly lift is the most versatile and inventive lift ever to hit the truck service industry. 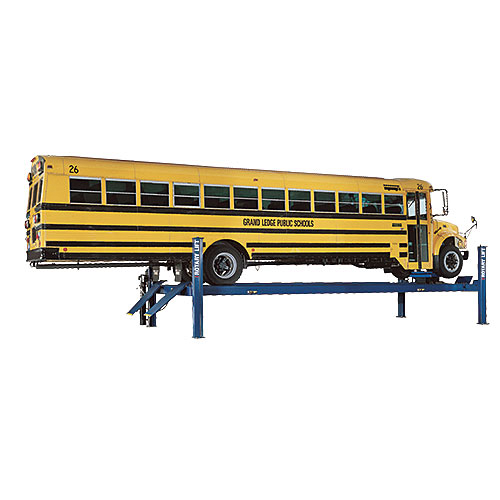 Rotary heavy-duty inground lifts are designed to increase productivity by providing an obstruction free shop and decades of service with minimum maintenance costs. 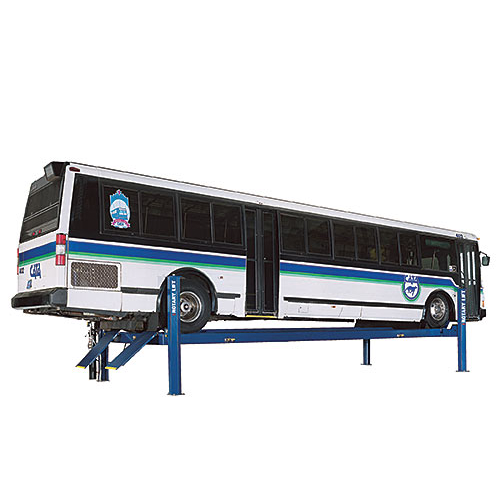 Each lift offers the adjust-ability needed to service a wide variety of vehicles in a single bay. 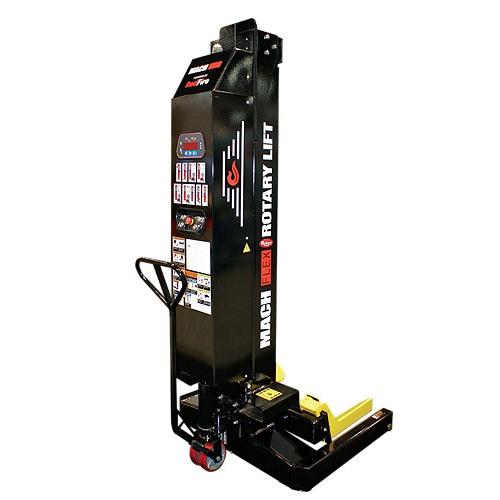 Whether fully hydraulic or electric hydraulic, two posts or three, numerous options are available to let you customize your lift for your exact needs. 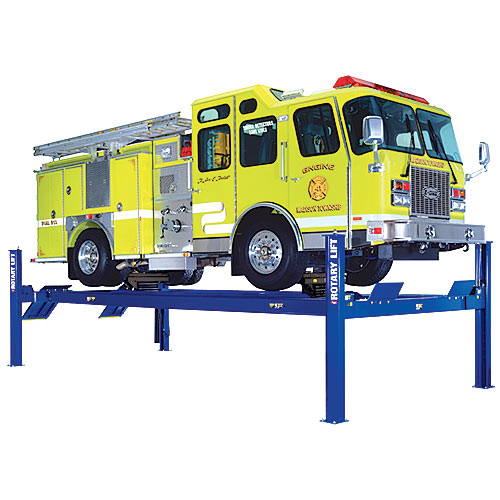 Rotary's heavy duty four-post lifts accommodate a wide range of vehicles with lifting capacities up to 60,000 lbs. Spotting friendly, this is especially important if you're the only tech working on the vehicle. No need to climb in or down from high places constantly to make sure everything is correct. You're already there once you're up on the lift platforms. Offer quick setup for undercarriage repairs. 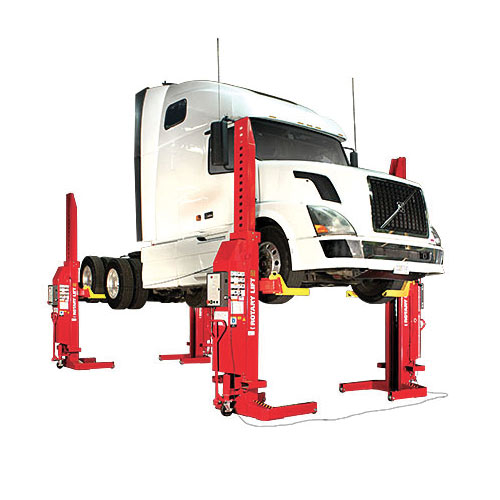 Setup your heavy-duty shop with a 4 post lift drive-through bay. Repairs could be made, drive off to test repair and if need be drive right back on. 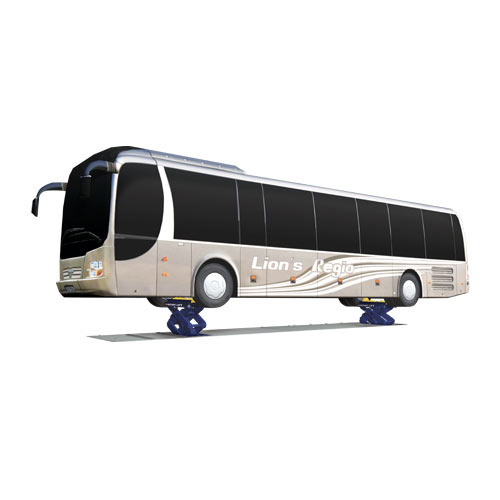 Can be used for wheel maintenance when combined with included or optional accessories. 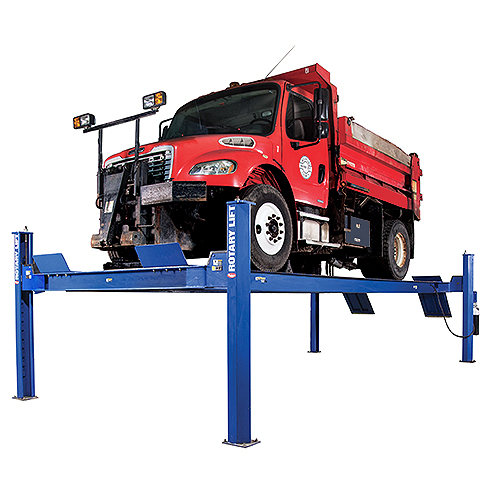 Rolling jacks on a 4 post lift turn the lift into a wheel free vehicle repair tool. It also gives you a spot to roll those giant wheels off and store on the platform, no need to break your back lifting them to the floor. 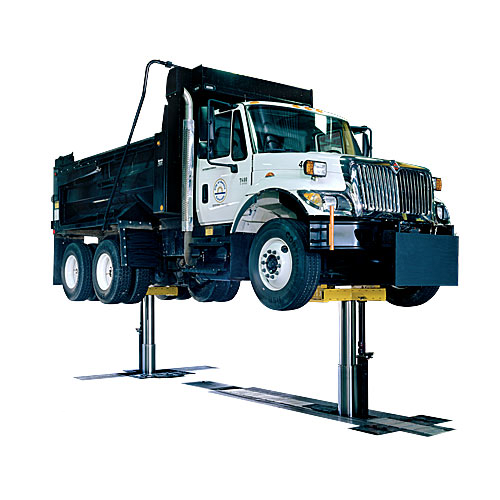 The parallelogram lift system is convenient for facilities and technicians. The parallelogram lift system is convenient for facilities and technicians. No column obstructions and a clear floor design allows for a productive work area. 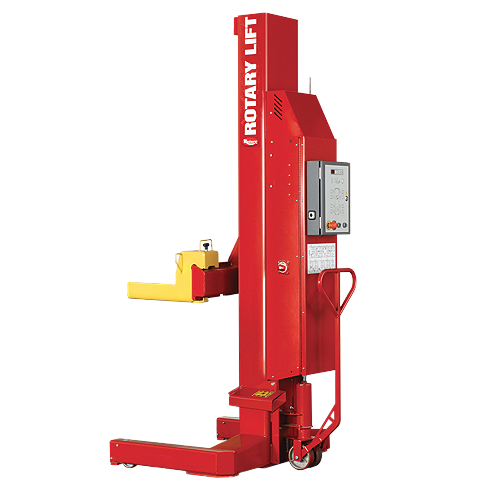 Numerous capacities and options make this lift an industry leader. The V-REX is a vertical rise platform scissor lift that offers clear spans of space in and around a massive lifting structure. 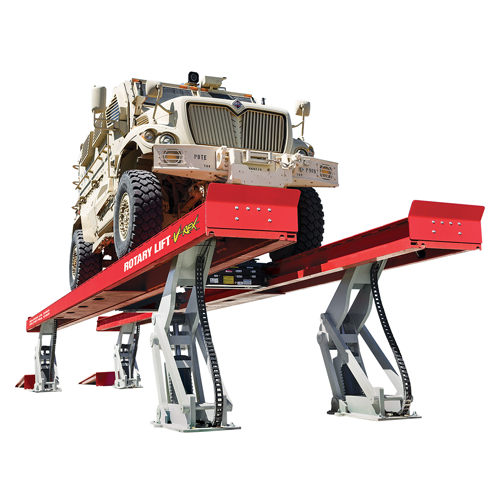 With capacities between 44,000 pounds and 80,000 pounds this lift is designed to pick up large trucks, heavy equipment and anything else you can think to drive on it, like FIRE TRUCKS filled with water! (within the rated capacity). The clear span design gives you ultimate clearance around the lift, while the specially designed platforms are engineered with the industry's lowest deflection rates. A brand new leg design manages all this heavy lifting on rotational hinge links. 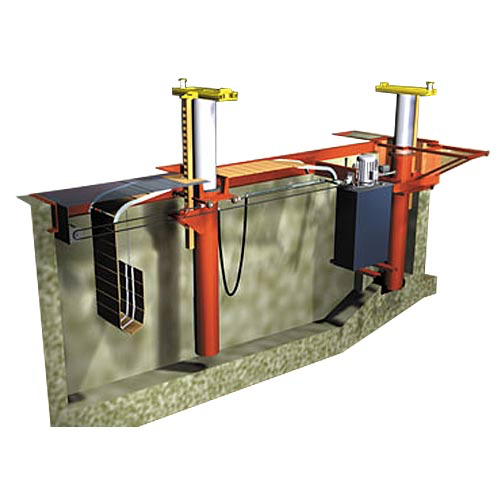 Limited sliding components and heavy-duty bearings ensure a long lift life. These same legs move in a rotational fashion optimizing the efficiency while providing strength.